I will start with the 'did you know'. I went to the post office today to post a 11cm x 11cm card to be told it was smaller than the minimum size for posting. Apparently the minimum size for the envelope is 14cm x 9cm so I had to buy an envelope to send the card and envelope in and it wasn't as nice as the envelope I used. The staff at the post office said that Royal Mail are clamping down and if I wanted to make sure it got to it's destination I should make sure that my envelopes are the above size or above up to the maximum size. I made 2 of these cards to send to the staff at the Hospital where my OH had to go with his Kidney Stones. 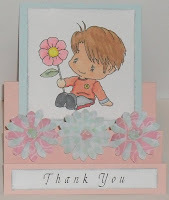 The image is from Sliejke digi Stamps I love her images and they are all free. She is a very talented artist and it would be well worth a hop to see her work. The image is coloured with Copics. The papers flowers are punched from some scraps of paper I had in my box from CC & Tinker & Co. The card is from a pack from The Range, now I know they are too small to make cards to send through the post I am using them as mats and stepper cards. If you open them out they will fit a C6 envelope. The sentiment was printed on my printer (who knew you could do that when you didn't have the right stamp - DOH)!!! I have tried to distress the edges of the white card and chalked with blue chalk but it doesn't show very well on the photo. This is so sweet Poppet. 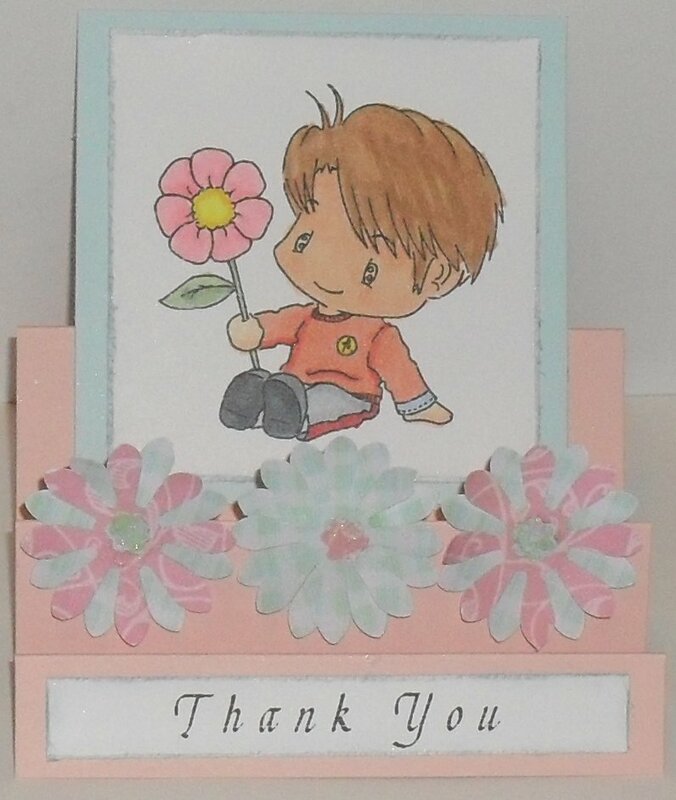 A very cute image, and your flowers are fab. I never seem to have the right sentiment even though I've got tons of them!